I hope that you have all been having a peaceful and relaxing holiday so far. What a busy half term it has been! I would like to begin by thanking all those who attended the Year R Liturgy on 12th February 2019. 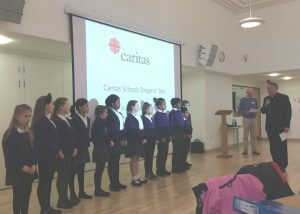 In addition, I would like to congratulate all of the children and staff who represented the St. Peter’s choir at church on Sunday 17th March 2019. At St. Peter’s, we continued our Worship during our Whole School Ash Wednesday service on 6th February 2019 – this was a beautiful service that enabled the children to ask God’s forgiveness of their sins as they embarked upon their spiritual journey to become close to God during Lent. The children were beautifully behaved and represented our school exceptionally. Well done to KS1 and KS2! Across the Spring term, pupils at St. Peters were able to demonstrate their participation in the challenges set by Mr Cunningham from their Lenten passport, attached below. 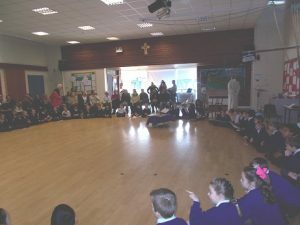 As we progressed through a reflective and prayerful 40 days of Lent, the children were given opportunities in their RE Curriculum learning to consider ways in which they could pray, fast and give to others as this stage during the Liturgical calendar. We were particularly impressed by the honesty of the children’s responses when setting their own personal goals and targets during Collective Worship. During w.b. 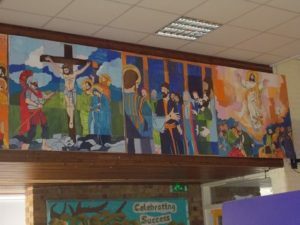 1st April 2019, each year group was invited to attend a bespoke Stations of the Cross reflection with the chaplain of Oaklands Catholic School chapel, in order to learn about Jesus’ journey to the cross and appreciate His love for all of Creation. 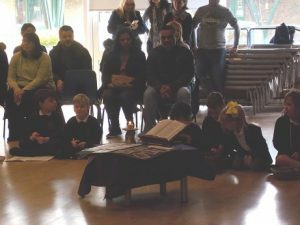 The children were very respectful and were enthusiastic when partaking in the Q&A sessions at the end of each worship – the range and depth of questions asked by the children reflected the high level of critical thinking skills from each class. Please refer to the photos below. Next term, we look forward to many more exciting developments in the Catholic Life of the school. For instance, in our prayer garden the pergola has already been installed and plans for future planting and growing have already taken place. Furthermore, following the meetings and discussions between members of St. Peter’s school council, our representatives have decided upon and agreed the following name for our new school building: The Unity Building – St. John Paul II. 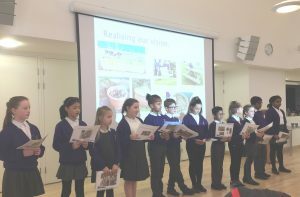 It has been wonderful to see the children responsibly taking part in the decision making process and for them to see their choices making an impact on the school – the building name perfectly encapsulates our school ethos and we cannot wait for the opportunities it shall give our pupils for demonstrating God’s gospel values and our school Mission Statement, across their curriculum learning. Today is Good Friday, when we remember the passion and death of our Lord Jesus Christ. It is not an easy story to hear, but we are reminded that Christ’s death was not without purpose. He died for us and for our Salvation. God of mercy, forgive us our sins. For the times we have closed our eyes to injustice: Lord, have mercy. For the times we have closed our ears to the cry of the Earth and the cry of the poor: Christ, have mercy. For the times we have closed our hearts to our sisters and brothers in need: Lord, have mercy. I wish you all a joyful and pleasant Easter. We look forward to seeing you all again on Tuesday 23rd April 2019. 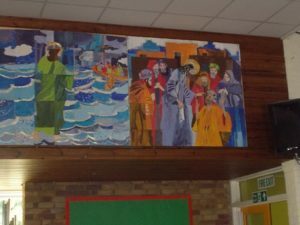 This is my first blog post as the RE Curriculum lead of St. Peter’s, and I very much look forward to using this blog as a means of updating you on St. Peter’s spiritual and religious journey across the course of the academic year. Upon reflection, as a Catholic School, we had thoroughly enjoyed and immersed ourselves within the religious celebrations and festivities that took place during Autumn term 2, towards the end of 2018. The generosity and gratitude demonstrated throughout our entire school community was heart-warming to experience. I would like to congratulate all of the children and staff who took part in the KS2 Carol concert at Sacred Heart church. The festive spirit was certainly spread to all members of the congregation, who particularly enjoyed the children’s musical performances. I would also like to take this opportunity to thank all those who had generously purchased cards at the church – all donations shall support the continual development of the St. Peter’s prayer garden. Furthermore, it was clear to see how the communal spirit had continued throughout the school’s Christmas dinner day. The children had a fantastic time with their friends, and their behaviour and manners were exceptional. Above all, I would like to say a huge thank you to all of the kitchen staff, parent volunteers and governor helpers who had enabled the Christmas dinner sittings for KS1 and KS2 to operate so efficiently. St. Peter’s has had an excellent start to the academic year 2018-19. Our strong results from the previous Section 48 Validation has enabled the school to stand in good stead as it makes continual progress as a religious establishment. Recent changes surrounding the assessment of Religious Education by the local Diocese has enabled St. Peter’s to develop further connections between religious scripture and how the Word of God influences the lives of modern day Christians. 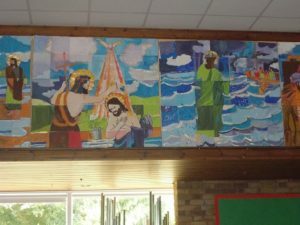 Pupils have enjoyed the opportunities for discussion and debate that this has opened up – in the context of each RE unit of study, children are now regularly given an opportunity to think critically and theologically about various choices, actions and events that may take place in the world around them. After half term, we look forward to continuing our Other Faiths unit, before moving on to Lent – so far, students have particularly enjoyed exploring a variety of different religions and places of worship. We are proud of our students for the respect they have demonstrated when learning about the practices and beliefs of various religious groups. Finally, I would like to inform you of an exciting update for 2019. We have been delighted to see the breaking of ground as the project of our new school building begins! 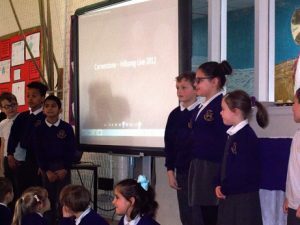 Already, meetings have taken place between our school council representatives, in order to select a name for the building that strongly reflects our school’s Mission Statement, religious values and spiritual ethos. We appreciate the co-operation of all students and staff throughout the completion of this project, and look forward to providing further updates soon. Our very last blog for 2017-2018! I can not believe how quickly this year has gone! I will be handing over the job of writing the RE blog as this is my last week at St. Peter’s. I have enjoyed keeping you all up to date (when I am not having technical issues!). I have had so many lovely comments about my blog which has made it a really rewarding way to communicate all (well many) things RE to you. We have completed a two year long whole school project which has now made it to its final destination. Mr. Cunningham asked me to give him a list of fourteen of Jesus’s life events which would summarise His life. 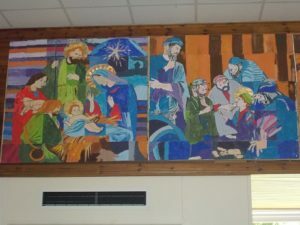 Mr. Cunningham then enlisted the help of an ex colleague from the secondary sector – an art teacher who then created large drawings of the fourteen events. 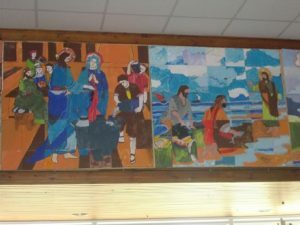 Each picture was then cut into enough squares for every child and adult in the school to paint – led by Mrs. Pearson in art lessons. They then reassembled the pictures which I think you will agree are absolutely stunning! 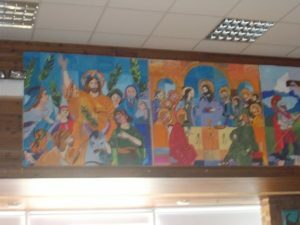 Our hall has been transformed by the beautiful, whole community art work. Help me to trust that you will walk with me on every step of my journey through life. Jesus sent out the apostles with instructions to take no more than sandals and a staff. When Jesus’s friends trust in God he looks after them. What do you take on your journeys through life? Mr Cunningham takes his Rupert the Bear, a special framed quote and a coffee mug! But he explained that the most important thing to journey with is your faith. With faith you can achieve anything. Where will your faith lead you? My faith is leading me to an exciting new start leading worship in a school in Portsmouth and some risk taking as I set up my own business! I wish you all the very best in your journeys and know I will see many of you around. The Gospel reading about the mustard seed is definitely one of our favourites at St. Peter’s. The meaning is simple yet powerful. How can we turn something small into something big? How can a simple smile impact someone’s day and then those that that person comes into contact with? How can a small amount of practise at a sport, musical instrument add to something amazing? A tiny amount of faith really can turn into something incredible! In curriculum RE we have started our topic about sacraments. In Year 3 we have a particular focus on the Eucharist which helps our children, along with their lessons with their catechists, to help prepare them for their very fist Holy Communion. Good luck to all the children who will be enjoying their First Holy Communion this weekend. Year 2 are focussing on the sacrament of matrimony – adding to Miss Allen’s excitement about her own upcoming wedding. Year 5 and 6 celebrated Mass together on Tuesday at Sacred Heart. It was a wonderful celebration! Thank you Father Jeremy. Year 6 will soon be planning their leaving Mass with Mr. Cunningham. This is always a very special occasion mixed with a variety of emotions from both parents and children! What gifts does the Holy Spirit give us? 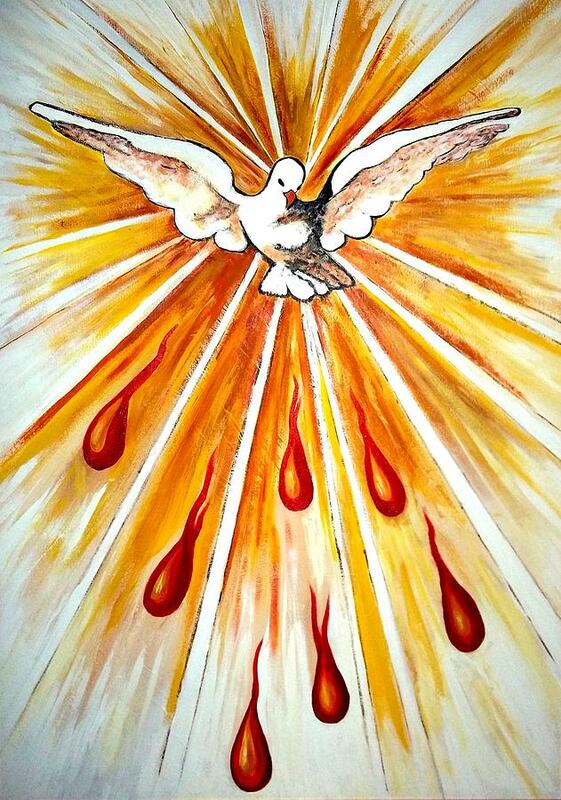 How can we accept the Holy Spirit in our lives today? This is the focus of our RE lessons and worships in all year groups from Year R to Year 6 this week. 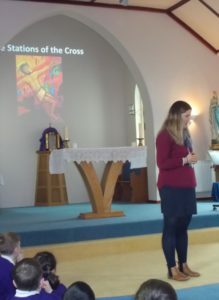 Mrs Edge led worship on Monday and talked about how we receive the Holy Spirit and how it transforms our lives. The gift of unity, prayer and peace were a focus. How can we use these gifts to bring Jesus into our lives every day? Some Year 5 children showed me some beautiful reflections today. 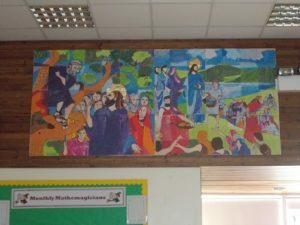 My own class have been thinking about how Pentecost links to the Eucharist, they have developed a really good understanding of some concepts that are pretty tricky for 7 and 8 year olds. They are definitely ready for their upcoming Holy Communion! Mr. Crozier had a problem in whole school worship this week – he couldn’t get a lamp to work. As he wanted us to sing ‘This little Light of Mine’, this wasn’t very convenient! But help from a Year 1 child soon came; ‘you need to be connected’. Mr. Crozier realised his mistake and said it was just like this with God. You need to be connected to Him to ‘work’ or to live a full and happy life. 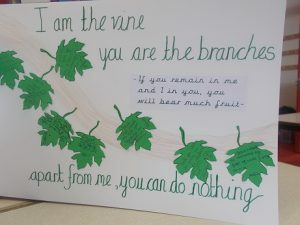 He shared the Gospel reading about the Vines and the Branches and continued to explain how the vines and branches need to stay connected to bear fruit. How can you stay connected this week? 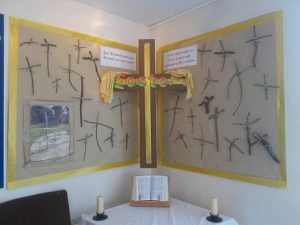 All children have been considering how they can stay connected to God this week. Year 5 produced a beautiful reflection for our Spirituality Book. 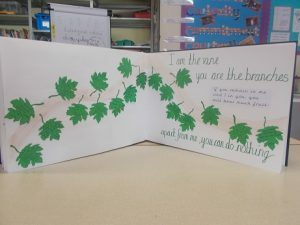 The Spirituality Book travels around the school with a different class responsible for it each week. It is a lovely way of sharing learning and reflections from across the school with all children. Years 3 and 4 walked to church on Tuesday. Luckily it was a beautiful morning. We were also lucky that our mass fell on the 1st of May so that we could celebrate the beginning of The Month of Mary. Thank you Father Jeremy, parents and parishioners for celebrating with us. Thank you to the Year R children and staff who produced a lovely display for the season of Easter in the school reception. Have a wonderful long Bank Holiday weekend! The sun is meant to shine! Children at St. Peter’s School are very familiar with this week’s Gospel reading. 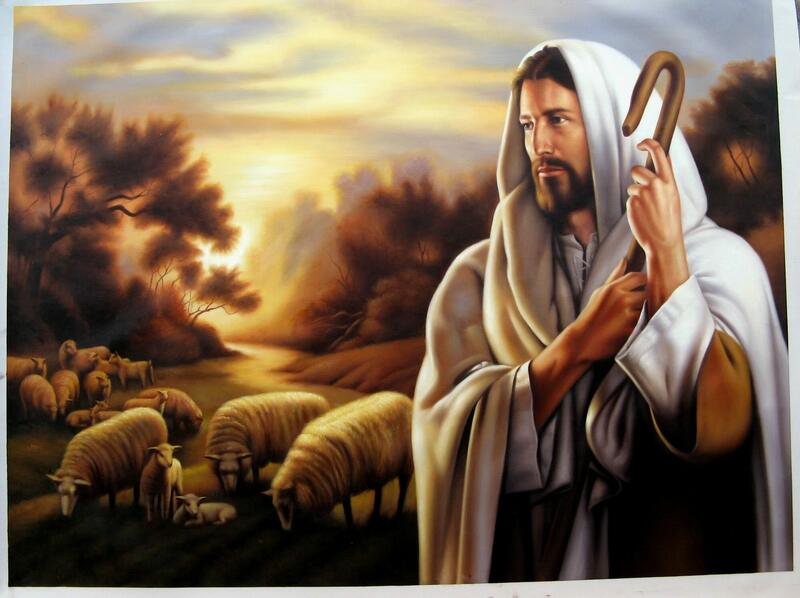 The Good Shepherd is definitely one of our favourites. We know that sheep follow each other and their shepherd and we know that Jesus called Himself The Good Shepherd because He wants us to follow Him. A bit like sheep would! In class worship this week we will be thinking about how we can be part of Jesus’s flock. How do we choose the right thing and follow Him? Sometimes this is hard and we don’t follow Him. How can we put this right? On Tuesday 1st May at 10.45, Years 3 and 4 will be celebrating mass at Church with Father Jeremy. This will be our first joint year group mass at Church this Year and we are very much looking forward to it. As it is the first day of a very special month in Church we will of course be dedicating the mass to Mary and our own Mothers. It would be great to welcome parishioners, friends and family. Happy Easter to all our friends and families. Always a busy week at St.Peter’s with this year no exception! Very well done to all the children who completed their Lenten passport. 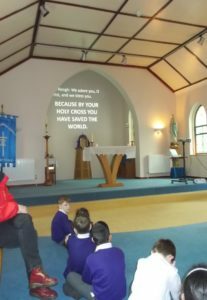 Children were challenged to attend as many Sunday masses as possible during Lent and ‘collect’ the Gospel reading for each week. They received a small religious momentum in our Golden Leaf assemblies this week which celebrate children’s commitment to our school mission statement. Also very well done to the winners of our Real Easter Egg competition. One winner from each year group received a Real Easter Egg which tells the true story of Easter. This Monday we gathered for our last whole school worship of the term. Mr Cunningham talked about the amazing welcome that Jesus received into Jerusalem to celebrate the Jewish festival of Passover. The children agreed that they would feel really special if the were welcomed somewhere in such a way and thought about how they welcome other people. We were then encouraged to think about how this welcome turned to betrayal for Jesus and how we feel if we are betrayed. Year 5 have been analysing the story about when Jesus drove the traders out of the temple. After much discussion we had lots of ‘Oh I understand now’ – Jesus knew that he would die and told the chief priests that if they destroyed the temple (his body) that he would rebuild it in three days. He would come back to life! This was the miracle that He said would be performed to show that He was worthy of behaving the way He did. We hope that you all have a wonderful holiday. Hopefully this weather will turn soon! Once again a very happy, blessed, peaceful Easter to you! This week my Year 3 class wrote the St. Peter’s section for the Church newsletter as I had a rare Monday morning away from school. They rather enjoyed the opportunity to ‘talk’ to the parishioners of Sacred Heart and St. Edmunds. Here is their contribution…. In other news Key Stage 2 had their Penitential Service this week in school with Father Jeremy. It was a wonderful way to prepare ourselves ready for Easter. Year R also had their Year group liturgy on Tuesday. Once again it was lovely to see so many friends and family. Year 5 met with our Bishop on Thursday. 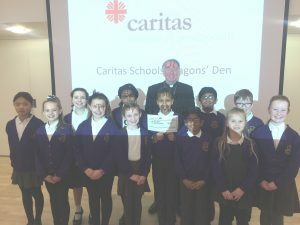 They have been involved in the Portsmouth Diocese Caritas Schools Dragons’ Den project. For weeks Year 5 have been asking staff and children what they would like as part of a prayer garden that they would like to create in the central court yard at school. Designs were created and submitted using PowerPoints to persuade their teachers. Mrs Turner then chose some children in Year 5 to represent the school. They travelled to Basingstoke yesterday to present their design ideas. They were an absolute credit to themselves, their teachers and the whole of St. Peter’s School. When Bishop Philip asked the children how the design reflected St. Peter himself Cecilia answered “well we would like to use rocks as part of our design because St. Peter is the rock of our church”. We are exceptionally proud to announce that the children secured £400 towards our prayer garden! We are very excited to have a new prayer garden which we will use as part of our daily prayer. Particular congratulations go to our pupil representatives…. Next week is Holy Week … please visit next Thursday to see some photos of our Stations of the Cross pilgimmages. Whole school worship had a very simple message this week; God loves each and every one of us. He loves us so much that He sent His only Son to save us. This week in St. Peter’s we will be making an extra effort to show those around us how much we love them. We have turned our thoughts to people that we don’t always find easy to get on with. God loves that person and so we too can show love and kindness to them. Even if that love comes through as a simple smile. 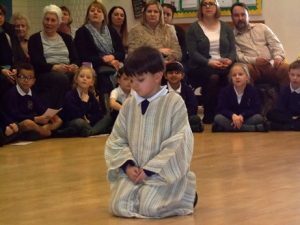 Year 2 had their year group liturgy this week where they reflected upon their journey through Lent and the difficulties that Jesus was faced with. It was lovely to see so many friends and family once again. Thank you for joining us Father Jeremy. We continue to see that tempting box of Roses chocolates on our school prayer table. By leaving them alone we are showing how much we love our brothers and sisters around the world as each chocolate is worth £2 to CAFOD. Hopefully your child or children are busy collecting the Gospel readings for their Lenten passports – we look forward to sharing this in the last week of term along with the winners of the Real Egg Palm Sunday competition.